“Cleaning the bathroom is so much fun,” said very few people, ever. It’s perhaps a reason why a quarter of our more than 1,900 recent Canstar Blue survey respondents said that they often argue with their partner/family over who cleans the bathroom. There are plenty of articles, blogs and guides keen to reassure us that a fresh and sparkling bathroom can be achieved in around ten minutes or so, and an impressive 11% of our respondents said that they clean their bathroom daily – and a suspiciously high 21% of us claim that our bathroom is so clean you could eat from it. But – is it really that clean?? When it comes to creating a fresh and hygienic bathroom, here are five spots that are easy to miss. Next time you’re singing in the shower, look up. How long is it since you removed the cover of your exhaust fan and cleaned it? Thanks partly to the location and partly to the fact that hot air rises, all sorts of gunk can very quickly build up on your exhaust fan cover. Next time you have a sunny day, take it down, give it a clean and sit it in the sun for a while. Depending on the type of light fitting you have, it may collect dust on top and/or insects inside the cover. A quick clean could do wonders for the quality of light in the room. The back of the toilet pan. 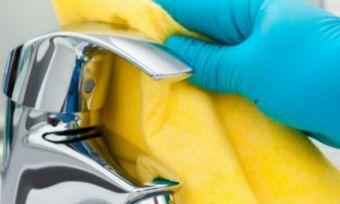 Yes, you clean the seat and inside the bowl and the lid and even the top of your toilet if you’re diligent – but what about the bit behind all that? The back of the toilet pan (or in other words, the outside part of the S-bend) can be out of sight, out of mind – and therefore a bit dirty! Next time you clean your shower screen and mirror, have a look at your bathroom window as well. In addition to making sure the glass is sparkling, also check out the window frame itself. Thanks to the humidity that builds up in bathrooms, mould can quickly accumulate on the frames of bathroom windows (as well as the ceiling cornices).